Q: "Mr. President, we're here in Argentina, and the United States, Canada and Mexico have signed a new trade agreement updating NAFTA." President Donald Trump: "That's right." Q: "Senator Elizabeth Warren back in the United States, who may run against you in 2020, says it doesn't go far enough. What do you say to that?" Trump: "Well, I guess it's easy for somebody like that to criticize because, you know, maybe she's running, maybe she's not. I thought she'd be disqualified by now after she did her whole Native American thing. I really assumed she would have been disqualified, but I can do that with any deal. Any deal you have, I can say, ‘Hey, didn't go far enough.' This deal is much better than NAFTA. It's a great deal for the United States. It's a deal we really like. We've gotten tremendous reviews on it, and I will say we have literally — I have not heard one person hit it. They really have liked it. Now, the other countries, if you're talking about a little bit of a hit, they get a little bit of a hit, but I think they made a good deal also. It's great for the three countries." Q: "Now, one of the parts of it has to do with autoworkers, auto parts. Is that in any way going to specifically address one of the issues the United States has, with GM closing plants and 14,000 losing jobs?" Trump: "Well, it is, and it's not only that. It's going to keep auto companies from moving. One of the things I really wanted was plants and auto companies, just in general — I mean jobs, factories — I don't want them leaving the United States. That was very important to me, and we're not leaving the United States. So I think one of the strongest elements of the new — and I call it the USMCA — one of the really important things is you won't see companies leaving once that gets signed. We have to get it through Congress, and if it gets through, which I think it will, that'll be great, and if it doesn't, we're very happy the way it is now." Q: "The G-20 is about global economics. As you sort of step back and look at the globe, what do you see is sort of the biggest threat, realistic threat, in the near future to the global economy?" Trump: "Well, you have many threats, but the United States really has been ripped off by so many different countries. I'm not giving you any secrets when I say China, the numbers that China has done on us for so many years, 25 years … "
Q: "Which you've been saying to me for years before you were even ever a candidate for president." Trump: "I've been saying that for a long time. When I was a young developer, I was saying that to you and everybody else. I mean, I've been talking about it for a long while. Japan, I used to use Japan. Now it's a little bit less Japan, but Japan is very active also. But it's almost everybody. It was almost like we had nobody that knew what they were doing about negotiating, trade, negotiating deals. We have almost an $800 billion trade deficit, and I'm changing that. We start with the USMCA, which is the replacement to NAFTA. We just made a great deal with Korea, South Korea, and I think that you're going to see some very big changes very quickly. We're talking to the European Union. That's been brutal for the United States, and again we're having dinner as you know with President Xi [Jinping] of China, and something could very well come out of that." Trump: "Well, I think they're going to have less money than they have right now, because the deal that I make, and if you look at — we have $250 billion [in imports from China] right now at 25 percent. That means we're going to be taking in billions and billions of dollars. Plus, I can double that up, and then I can double it again, and they could never do what they did in the past with other presidents, because — and you see what's happening with China. I don't want to do this, but they are not doing very well now compared to what they were doing, and again, I think that we are doing well. We picked up $11.7 trillion in worth since my election, and China's lost a great deal of worth, and we are now a much bigger economy than China. Which a lot of people don't know, but we're a much bigger, and really a much more powerful economy than China." Q: "But as a national security point, you know, with their investment in Latin America and all over the world, it does seem that they are making a bigger footprint around the world." Trump: "I know, but they have a debt problem and they have to pay for that debt. It's a tremendous amount of money that they're spending. Do I like it? Probably not, but I also know it's very expensive for them, and a lot of those places aren't going to work out." Trump: "Well, I just said that, you know, frankly, in light of what happened with Ukraine with the ships and the sailors, it just wouldn't be the right time. But I will meet with him. I think we have a very good relationship, and I think we're going to have a very good relationship with Russia, and China, and everyone else. I mean, I think it's important. So I'll meet with him at the appropriate time." Q: "What do you think he's thinking about doing with Ukraine? Why did he seize the sailors and the vessels?" Trump: “I can't read his mind, and nobody can, and he knows what he wants to do, but we can't allow certain things to happen. You know, it happened, and I just can't be a part of it." Q: "One of the issues of a global economy is climate change. That's a discussion here. What's your position on climate change and how it has affected the economy worldwide?" Trump: "Very simple. I want the cleanest air and the cleanest water on the planet. I want crystal clean water, and that's what we have. We've been doing very well with respect to the environment, and that's what I want. But I'm not going to put the country out of business trying to maintain certain standards that probably don't matter. When you look at China, and when you look at other countries where they have foul air, they have not good air that comes over to the United States. People don't want to talk about it, but it comes over. So we're going to be clean, but they're not, and it costs a lot of money. Well, the fact is, we are absolutely clean, but we're not going to spend trillions of dollars and make it good for others but not make it good for our — you know, I have a very simple policy. It's called America First. At the same time, we're going to be a great neighbor to the world. But we have to treat ourselves fairly, so that's the way it is." 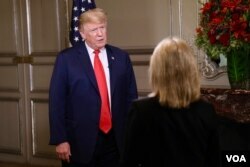 President Donald Trump answers a question from VOA contributor Greta Van Susteren on the sidelines of the G-20 Summit in Buenos Aires, Argentina, Nov. 30, 2018. Trump: "We'll talk about it. We’re talking about a lot of things. The big thing we’re talking about is trade. That's what people want to hear, and you know, he's got to do something with his climate, his climates, a little bit, though. But, and I'm sure he will. I think he's — he's a friend of mine and a good man, but you know, we have a little bit of a dispute. And again, our country has been taken advantage of for many years, and that's just not going to happen anymore." Q: "There's a big vote coming up in the House of Commons in the UK. [British] Prime Minister Theresa May is here. Brexit is a trade issue — how is she handling it? And what's the impact on the United States." Trump: "Well, it's a very tough thing. I told her I would've done it somewhat differently — actually quite a bit differently — but I think she's a good woman and she's really working hard. I mean, what she's going through, she's — that is a hard situation for her. I would've done it differently. I would've had a much different attitude. I think the concept of what they're doing, you know, separating is good. That's a good thing. They want their own identity; they want their own immigration laws; they don't want to be told who they want and who they don't want. But she's working very hard, I will say that." Q: "In terms of, though, the impact on the United States, is the United States sort of a spectator to what's going on with Brexit, or is it directly impacted?" Trump: "Well, we told her, yeah, it is — we are a spectator, to a certain extent." Q: "It has no impact on the United States?" Trump: "It's their country. I mean, they have to do what they have to do, and we'll see if they get to a parliament. It's going to be very interesting to whether or not they do. European Union, it's a tough group. I will tell you they are just about as rough as china on trade with us, and they're going to be next. They'll be next, but the fact is they're very bad on trade with us. They have tremendous barriers. They have great barriers, tremendous. They have nontariff trade barriers also, and they have tariffs, they are — we lost with them over the last couple of years $151 billion a year. That's the European Union, you know? You think about it. Sounds so nice, but they've been very tough on trade, so they were tough with her. But we'll take care of our share, I can tell you that." Q: “All right, now, our domestic economy. Next week there's a vote possibly on a government shutdown. First of all, do you think there's going to be a U.S. government shutdown, and does that have any sort of global economic impact?" Trump: "Well, I can't tell you if there's going to be a shutdown because nobody knows. But I will tell you we're going to have border security. We're going to have a lot of border security. You saw what we did with the all of the caravans coming up, and now they're starting to head out, they're starting to go back. But we are going to have security. We're not going to let people come into our country illegally. We're going to have people come in on merit. We need people, you know? We have the lowest unemployment rate we've had in 51 years. We need people in this country. We have companies moving in. In fact Prime Minister [Shinzo] Abe of Japan just told me they're moving two car companies. They're going to be opening up two massive plants, you know. You don't hear that often, but a lot of that is happening. You hear about General Motors, and I don't know what happened with General Motors, but the trend is exactly the opposite. And I will say this: Our economy has never done better. We're doing unbelievable numbers, you see that. And a lot of good things are happening." Q: "$5 billion is what you want for the wall, this would go around. So far, Congress is saying that it won't. So what happens?" Trump: "We'll have to see what happens." Q: "Are you willing to negotiate?" Trump: "Look, I'll just tell you this. We're going to have border security. And if we're not going to have border security, some very tough things are going to happen. But we're going to have border security. We can't have people pouring into our country like they have over the last 10 years. And you see what's happening when you have MS-13 and these gang members, and look at the caravan. Now they have over 650 people that are absolutely stone-cold criminals. I don't want them in our country. I'm not going to have it. If you don't have borders, you don't have a country, Greta. And I'm not going to have it." Q: "One last question, and I'll give you a chance to educate there — at least talk about the American media. What is it the U.S. media collectively doesn't understand about the economy? When you look at things, hear our reporting, do you have any thoughts on our reporting?" Trump: "Well, I think they understand the economy. They know how well we're doing. They just don't like to say it because that's good for me, so they don't want to say it. Look, I call it fake news. I don't say the media, I say you have so much false reporting. But we have a phenomenal economy, they know that. We have the best unemployment numbers, as a group, that we've ever had. You look at African-American unemployment and Asian and Hispanic American. You look at all of it, they're the best numbers in history, the best — I mean, these are historic lows. So the media knows how well we're doing. They tend not to want to write it." Q: "So you like discussing economy with these world leaders?" Trump: "I do. I mean, we have the best economy in the world. Actually, every leader came up to me, virtually, and they said congratulations on the great economy." Q: "Mr. President, nice to see you." Trump: "Thank you, Greta. Nice to see you. Thank you very much."